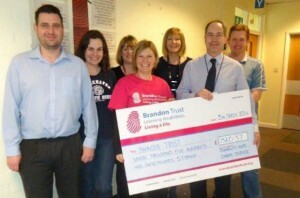 What you can do for the Brandon Trust. And what it can do for you. Volunteering provides a simple low cost way for staff to work together and at the same time support their community. But finding the ideal volunteering partner is difficult. Particularly as the Civil Service works across a diverse range of departments and subjects around the country, and every team has different needs and objectives. To help answer this question the Civil Service Local team has found a partner who has opportunities across the south you can get involved with. The Brandon Trust is a charity that works with adults and young people with learning disabilities and autism. It helps them develop life and social skills and gives them education and employment training. It also provides supported living and respite care. Providing such a wide variety of services means the trust is able to offer a range of projects from Cornwall to London. The CS team also encouraged teams to raise money by donating electrical items, foreign coins and spectacle cases. These are then reconditioned and sold to raise funds for the Trust. In this year alone, the monetary value of the work done by civil servants and the donations they made was over £52,000! Over £43,000 was a ‘value in kind’ figure provided by the trust, and donations totalled £9000. “The donations continue to make a real difference to the lives of the individuals that the Brandon Trust supports, enabling them to overcome isolation, build confidence and self esteem and find their place in the local community”. She also added that as well as the financial benefit, these events help to send a positive message to the general public about the trust and what they are striving to achieve. Civil servants have not only given positive feedback about working together in teams to support the local community, but also how rewarding it has been to work alongside those with learning difficulties whom the trust supports. DWP in particular felt taking part increased their understanding of helping those with disabilities into work and adopted the Trust as their Charity of the Year 2013. CS local will continue to support the Trust in 2014 to 2015, so look out for more information on our website and read more about the trust here.